Quantum physics allows us to understand the nature of the physical phenomena which govern the behavior of solids, semi-conductors, lasers, atoms, nuclei, subnuclear particles and light. In Quantum Physics, Le Bellac provides a thoroughly modern approach to this fundamental theory. 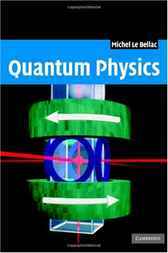 Throughout the book, Le Bellac teaches the fundamentals of quantum physics using an original approach which relies primarily on an algebraic treatment and on the systematic use of symmetry principles. In addition to the standard topics such as one-dimensional potentials, angular momentum and scattering theory, the reader is introduced to more recent developments at an early stage. These include a detailed account of entangled states and their applications, the optical Bloch equations, the theory of laser cooling and of magneto-optical traps, vacuum Rabi oscillations and an introduction to open quantum systems. This is a textbook for a modern course on quantum physics, written for advanced undergraduate and graduate students.